"This is delightful: a campaign by Pixar for its upcoming film Monsters University that spoofs those wonderfully cheesy college–recruitment ads that air during NCAA sporting events. The spot below, which ran during this week's Rose Bowl telecast, promotes the movie's eponymous institution and imitates the source material perfectly, from the tagline ('Image you at MU') to the awkwardly saccharine student testimonials. The whole spot is nicely paced ahead of the amusing reveal halfway through. (The realism of the animation helps a ton, too, and is its own best marketing for the film.) The website, monstersuniversity.com/edu, is quite brilliantly done as well. The 'Student Policies' section is particularly inspired. On the issue of 'Basic Monster Respect,' it offers this advice: 'All monsters are unique – by heritage, number of appendages, or simply number of eyes – and all monsters deserve respect.' Pets, it should be noted, are not allowed on campus, 'with the exception of seeing–eye snakes.'" "'Set fire to your hair, poke a stick at a grizzly bear ... Dumb ways to die ... dumb ways to die–ie–ie.' If the chorus isn't stuck in your head, it will be soon. Melbourne Metro Trains' darkly cute – and irksomely catchy – new ad for transport safety has gone viral, notching up a whopping 4.2 million YouTube views in less than a week. And nobody is more stunned by its success than the man behind the music, Sydneysider Ollie McGill. The Cat Empire keyboards player was commissioned to write the score to accompany lyrics to the McCann Group's new ad and has watched Facebook likes, Twitter shares and YouTube hits skyrocket as word of the animated video has spread like wildfire. ... 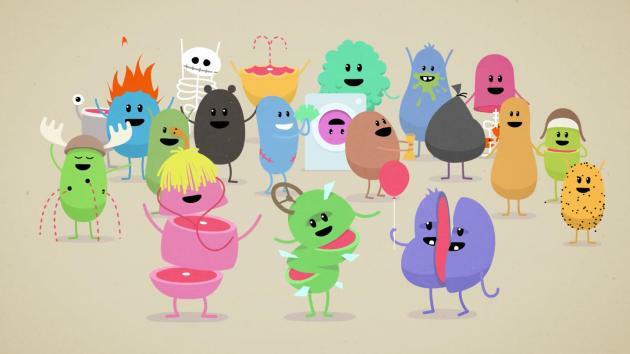 In the ad, cartoon characters meet their ends in a number of colourful, sardonic ways, including a couple of nasty mishaps on train tracks, while the sweet chorus, 'dumb ways to die ... ' is instant earworm material." Fig.1 Victor [http://www.11secondclub.com/users/profile/22666] (2010). "unBearable", Eleven Second Club. "A teddy bear is at the centre of a dispute between a monkey and a bear". Audio taken from the feature film "Planes, Trains & Automobiles" (1987).